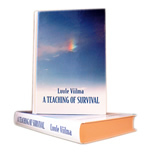 What is a Teaching of Survival? The shortest answer to that question would be that it is a series of books written by Dr. Luule Viilma. These books are focused on treating illnesses using only the power of mind. So in these books you will find the theoretical basis of mind-healing, practical methods of healing yourself and real-life samples about Dr. Luule Viilma’s patients. Luule Viilma (1950-2002) was one of the greatest spiritual teachers and writers of Estonia. Her books became bestsellers in Estonia, Russia, Finland, Latvia and Lithuania. Online ordering on www.apollo.ee (Estonian book retailer online shop).